"Technology invariably trumps ideology. We develop ideologies as a way of coping with technologies; technology as drivers, ideologies as attempts to steer." The previous post gave information on the technology of Orb Running; more generally, it gave information on a technology for transformative brain change. S.M.I.2L.E., an acronym devised by Timothy Leary, formulates an open-ended, endlessly ramifying ideology for the future: Space Migration + Intelligence Increase + Life Extension. It serves as a practical formula for individuals on any kind of evolutionary trajectory as well as providing a conceptual basis for the advancement of collective human endeavor; a reach for the stars. Neuromancer, by William Gibson, gives a compelling and visceral literary expression of the S.M.I.2L.E. paradigm. 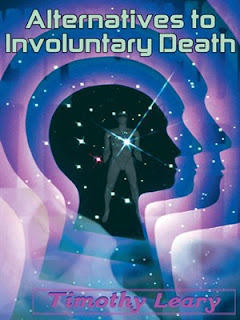 For example, the book populates the L4 and L5 orbital belts, where Gerard K. O'Neil and Timothy Leary wanted to establish space colonies, with worlds that resemble Leary's High Orbital Mini Earths (H.O.M.E.s), but with a realistic, gritty, human portrayal as opposed to Leary's more utopian vision. That covers Space Migration in the conventional exterior sense. Space Migration also gets implied in the interior sense through the characters adventures in cyberspace. Life Extension turns up in two prominent ways. The power-elite clan, the Tessier-Ashpools, keep their own meat carcasses frozen in cryogenic suspension with timed intervals of reanimation in order to extend their physical life span. Online immortality gets a play through the character of Dixie Flatline whose mind and personality managed to get downloaded onto a storage device before his meat carcass died in a cyberspace misadventure. Dixie seems mentally as sharp as ever when the personality/mind recording (a soul recording?) from his deceased body gets uploaded back into the matrix. He frequently becomes Case's (main protagonist) guide and informant in the cyberspace realm whenever Case jacks into the matrix. Both of these forms of Life Extension get a dystopian treatment in Neuromancer, a radical departure from Timothy Leary and Robert Anton Wilson's hyperbolic optimism on the subject. The Tessier-Ashpools complain of the cryogenic cold they can feel, the patriarch ends up committing suicide to get away from it. They are the richest, most powerful family and they are also the coldest. They're almost all cold. No social/political/economic metaphor there! Dixie Flatline hints at some dark existential suffering and asks Case to delete him after his duties have been discharged. The central part of the S.M.I.2L.E. formula, Intelligence Increase, seems the least obvious, the most occult and hidden in the book, yet also the most optimistic. Most of the events in Neuromancer get put into motion by a huge Artificial Intelligence named Wintermute, a veritable V.A.L.I.S. - a Vast Active Living Intelligence System. In this regard, it's interesting to hear Gibson in a 2010 interview with Steve Paikin suggest that Google is an Artificial Intelligence; "[it's a] vast hive mind that consists of us." Wintermute was designed and put into existence by one of the Tessier-Ashpools (3Jane if I remember correctly) to mute the winter, the incessant coldness that seeps into the bones of the cryogenically frozen. This coldness seems more than physical discomfort and pain, a sense gets conveyed of emotional and existential coldness as well. That the AI Wintermute becomes a solution to this problem implies that whoever designed it can transfer their awareness and cognitive abilities out of their frozen meat carcasses and into its vast active living intelligence system. I would call that an increase in intelligence to have that ability. Gibson borrows the idea of I.C.E., which stands for Intrusion Countermeasure Electronics, from fellow science fiction writer, Tom Maddox, to protect the architectonic structures of propietary corporate data. To penetrate any large system of data in cyberspace you first have to cut through the ICE. Qabalistically speaking, ice is frozen water and water always relates to emotions. In this light, ICE becomes a metaphor for Wilhelm Reich's concept of emotional armor. The name Wintermute suggests a shedding of this ice, this emotional armor, on a vast scale. Intrusion Countermeasures Electronics seems one of those puns with two completely opposite meanings. 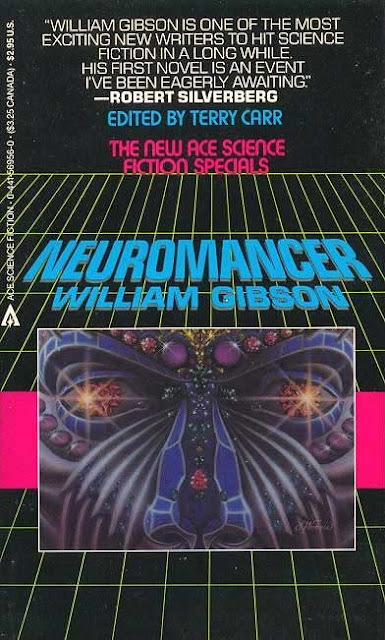 The intelligence increase communicated in Neuromancer primarily concerns emotional intelligence of the higher kind; what Leary and Wilson refer to as circuit 6 in their model. This emotional intelligence appears refreshingly free of sentimentality; sentimentality = sense the mental, not real emotional intelligence at all. Gibson seems so tuned in and turned on to Leary's vision that I attempted to find out what kind of influence Leary had on him before he wrote the book. I couldn't find any evidence that he'd ever read Leary or Wilson, but also didn't have much time to research it. Leary and Gibson certainly bonded after Neuromancer published. Leary developed the video game Neuromancer based on the book. 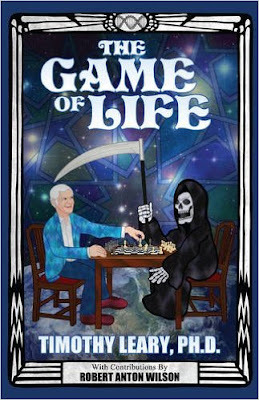 He also included the two obvious life extension methods Gibson put in the novel in a 1991 essay for Magical Blend magazine: 22 Alternatives to Involuntary Death. This got expanded and is currently available as the book Alternatives To Involuntary Death. In an interview Leary did with Gibson, the good doctor mentioned that the only book he'd ever annotated besides Neuromancer was Gravity's Rainbow by Thomas Pynchon. He went on to relate how he'd received Gravity's Rainbow in prison after a long spell of no books in solitary confinement; like eating an incredible meal when starving. No wonder he took a strong imprint with that book. Gibson related that when he got Gravity's Rainbow he retired from all other activity for several days to read and reread it; voluntary solitary confinement. Neuromancer and Gravity's Rainbow are two very different books, but what they both have in common is the frequent and visceral portrayal of death, so much so that you could say it becomes a character or an underlying omnipresent condition. Neuromancer (the name of the book, but also the name of an AI character in the book, Wintermute's twin, thus revealing the book as a form of AI) gives it away in the first sentence, "The sky above the port was the color of television, tuned to a dead channel." Leading with, "The sky," ending with "dead channel" suggests viewing death as a transcendent change as opposed to an absolute nihilistic end or some other terrible thing. The title Gravity's Rainbow commonly gets explained as indicating the rainbow-like trajectory of the V-2 rocket as gravity pulls it to Earth. Pynchon, known for his multiple meanings and levels of writing as well as his expertise in qabalah (see Against the Day), could just as well have named it Gravity's Rainbow to indicate the trajectory of a person's life as it's brought back down to the ground through gravity of death. In popular mythology, rainbow means God's promise or just hope, so if we see it as the gravity of death, then the rainbow indicates some kind of transcendent promise or hope. Again, death appearing as as transcendent change. In turn, Neuromancer appears to have influenced Pynchon, particularly in his last book, Bleeding Edge, in which the internet and the deep web play as strong a role in the plot's landscape as the matrix did in Neuromancer. The powerful antagonist putting up great obstacles in Bleeding Edge is named Gabriel Ice. Pynchon would know that Archangel Gabriel represents the element Water in qabalah; Gabriel Ice reinforces the notion of water (emotions) that is frozen. Pynchon seems to have to same intent as Gibson did with ICE though connecting it more with the everyday human world by making it a main character. There are 24 chapters in Neuromancer and there are 24 stages in Leary's 8 Circuit model of consciousness as given in his book The Game of Life. I remember Leary prefacing a lot of the stages and circuits with neuro: neurosomatic, neuroelectric, neurogenetic, neuroatomic etc. then a few years later out comes Neuromancer which seems like a doctoral thesis on S.M.I.2L.E. I believe this illustration is by Bobby Campbell, but I'm not certain. We see more I2 information in the names Gibson gives his characters. One of them, Finn, is a surrogate used by Wintermute to deliver messages and help out Case. He seems to pop up at random times throughout such that when he reappears you could say, "There's Finn again." I made the connection to Finnegans Wake in the first post, but there's more. The initials of the main male character in Finnegans Wake is HCE, in Neuromancer it's HDC (Henry Dorsett Case). The H in Finnegans Wake stands for Humphrey. We have Humphrey and Henry as the protagonists in the two books. We are told HCE also stands for Here Comes Everybody in Finnegans Wake suggesting that James Joyce wrote the character to represent everyone or anyone. Except for one instance, Case is always referred to by his last name. The pun in his name seems obvious, Case could potentially be anyone, a test subject for the next step. His middle name, Dorsett = door + set; that appears an obvious qabalistic reference to higher emotional intelligence; door = daleth = the letter "d" = Venus. The difference between HCE and HDC is the letter D in the latter. The main female character, Molly Millions, suggests Tiphareth because of the 6 zeroes in the numerical form of her last name. Except for one mention, her last name is hidden throughout, she's only known as Molly. Her chip pulsed the time. The character climbing up is Molly with Case there virtually. He has a device that lets him switch from the matrix to jack into her nervous system and experience everything she does. This is the first instance we see a time readout, it recurs about 4 or 5 more times though never again with a 23. I couldn't tell if Gibson was hip to the 23 phenomena until I read the first sentence of chapter 23. Most people, after they get afflicted by this condition, ask, "what does it mean, all these 23s?" Wilson writes in Cosmic Trigger, " I accepted the 23 engima as something I should attempt to decipher." If we consider that this is one of those 23s and that it relates to her climbing out of gravity then a meaning is suggested that connects 23 with some kind of greater or lesser transcendent experience, climbing up the ladder one rung at a time. I consider it a good sign when I encounter synchs with 23. Molly fished the key out on its loop of nylon. I could compose a whole 'nother blog about the qabalistic correspondences in this densely informational innocent looking sentence, but I'll try to restrain this tendency. both "out" and "on" represent different magick formulas in Crowley's language. the key = death ("fished the key") ??? the key = "out" ( the formula of OUT gets explained in Chapter 23 of The Book of Lies) ??? the key = "on" ( see the listing for 120 in 777) ??? the key = out on ??? All of the above, some or none of the above??? Robert Anton Wilson states unequivocally that 23 became an important key for him. And he woke again thinking he dreamed, to a wide white smile framed with gold incisors, Aerol strapping him into a g-web in Babylon Rocker. And then the long pulse of Zion dub. Again, some amazing qabalah. For instance, "strapping him into a g-web" indicates the path of Gimel which connects Tiphareth and Kether; the heart with Zion. The High Priestess becomes the guide for that path, in Thelema she is called Babalon and she does become a rock of stability through the nebulous, treacherous terrain of the desert Gimel passes through. Molly Millions plays the role of Babalon, the High Priestess, in Neuromancer. Her last name gives it away. My job when I write a book is to access a lot of parts of myself that are magical, and they're not particularly remarkable, but they're not available to me ordinarily, they became available to me through the process of writing the book. So I sometimes get the strange sense of sitting there and watching it happening, which is great! It's good work when you can get it. I don't get it that often. The metaprogramming world appears mostly blue and very watery. To activate a different metaprogramming module in this world, to enter a new set of instructions into the Deep Self, one has to swim through a channel of cool clear water; the modules are connected through canals of water. Metaprogramming code doesn't get written on the surface, it gets written in the depths to be played out on the surface. One has to dive deep into the depths, a potentially hazardous activity, or bring the depths to the surface in order to reprogram the code; to make a significant change. 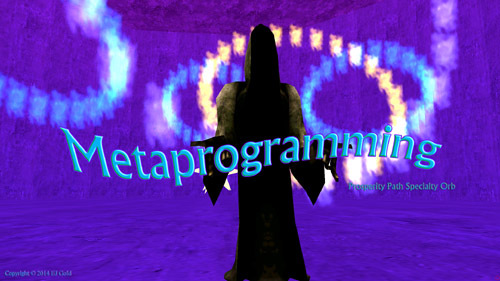 Metaprogramming - a computer programming term adapted by Dr. John Lilly for the purposes of self-induced, voluntary evolution. It means programming our programming, changing our habits and ways of functioning, our automatic, reflexive responses, how we habitually see the world. This is a post about a technology making possible conscious change in the depths and on the surface. Orb Runners jack into the Virtual Reality (VR) of the Prosperity Path Orbs like Case jacking into the cyberspace matrix in William Gibson's dystopian Sci-Fi thriller, Neuromancer. The graphics in these orbs look primitive beside contemporary World of Warcraft-type computer video games, yet they're good enough to provide a doppleganger, a cybernetic body double, a vessel to place conscious attention into that allows the game runner to enter another world: jack into cyberspace. Cyber originates from an ancient Greek word that means "to steer." What does that mean, 'to steer space?' Who is driving? This digs up a memory of the hilarious Abbott and Costello comedy sketch, "Who's on First?" We call it voyaging the Macrodimensions of the Labyrinth, in bardo terminology. Ariadne's thread becomes the thread of consciousness; maintain the thread of consciousness. "The matrix has its roots in primitive arcade games," said the voice-over, "in early graphics programs and military experimentation with cranial jacks." In the audio world, a jack plug is a 1/4" connector. A jack cable, as they call them in Europe, is a common guitar cable used to plug an electric guitar into an amplifier. To jack in is to connect. You jack into an orb with your attention. One thing it shares in common with Magick. Gibson's brilliant writing and superb descriptive use of language communicates a palpable sense of alternate worlds and virtual realities. The reader uses their imagination to enter the VR of the story and receives a taste of dimensions outside the consensual human one. In the same way, Orb Runners uses their various attentions - sight, sound, visualization of tactile and aromatic sensations etc. - to get a full immersion into the Orb; to get an experience of that Virtual Reality and effect change in the process. The virtual and the actual both seem real; virtual reality, actual reality, both real The virtual in between the events of the actual = the bardo, the place of choice-points where metaprogramming can occur. The virtual worlds of the Orbs are not only real and alive in their own way, practical application has shown they can influence and affect the actual world both implicitly and explicitly. Orb running = one kind of magick, ritual magick. Don't take my word for it, experimentation will verify or refute these propositions. Most of the orbs are intended to either increase the intensity of a quality that's lacking (eg. the Courage orb) or remove/reduce an excess of an undesireable quality (eg. the Worry, Obsession, Anger Detox orbs. ), or perform a specific function (Chakra Cleanse, Karma Burn, Get Well Soon, Clear Light, etc) Some orbs are designed to impart or help strengthen a skill (eg. Astral Trainer) Running orbs becomes a service when the orb is run on behalf of someone or something else. To do this you press the "P" key on the keyboard upon opening the program which brings up a prompt to enter the name of the entity or entities you wish to run. The benefits of the run still accrue to the proxy runner in the same way as a bardo reading benefits the reader along with the voyager who receives it. The Orb Selection Portal divides the orbs into 8 categories. The majority of orbs I run are in the Remedies or Cleansing categories. The Get Well Soon orb, found in the Power category, has an obvious use for Healers. One runner I know has recently been running this orb for the United States. Other frequent fliers are found in the Specialty category: Peace, 6 Worlds, Metaprogramming and Stress Relief are some of those. Many of the orbs have a similar structural form and/or shared aspects that cut across categories. For instance the Panic and Find It worlds appear very similar with the main difference being that there are things to find in one of them. I won't tell you which one. The titles of the orbs don't necessarily determine the reason for running it. You don't have to be in a panic to benefit from the Panic orb. I run this one frequently not because of often getting subject to panic or anxiety attacks, but because it has a nice representation of the 4 Elements, Air, Water, Fire, Earth - good to use for balance. Common features in the orbs may indicate how this brand of magick works. Remember that all of the orbs were designed by E.J. Gold aided by his team of programmers. E.J. Gold demonstrates expert familiarity with qabalah in his books so it behooves us to at least glance in that direction to help grok the orbs. You are presently Out of Body. Proceed ahead for full HUD boost. Just as Case "jacked in to a custom cyberspace deck that projected his disembodied consciousness into the consensual hallucination of the matrix." HUD stands for Heads Up Display. More explanation on these game details is found in an earlier post. That post also fleshes out the transformational potential, the magick, of these orbs. Your Matrix Attunement was successful, COUPLING FACTOR is in. Matrix connects with Neuromancer while also suggesting the Matrix trilogy of films which also has much valuable information pertinent to voyaging in computer simulated worlds. There appear several points of contact and overlap between Neuromancer and the Matrix trilogy. The electronics definition of coupling factor is given in the earlier post linked to above. Coupling factor can have several meanings. I look at it as resonance that communicates energy. Also see it as a coupling between the virtual reality of the video game and the actual reality of the human playing it. This makes it possible for events in the game to affect the player playing it. Step into the white fountain spraying blue streams of water with its circular troughs collecting pools of water in the Stress Relief, Pain, Panic, Amy's Beauty Boost, or Find It orbs and experience the sensation of cooling off in the human operator. 1. Know then, that as man is born into this world amidst the Darkness of Matter, and the strife of contending forces; so must his first endeavor be to seek the Light through their reconciliation. "Thou then, who has trials and troubles, rejoice because of them ..." - seems encouraging under almost any circumstances. "... a pathway opened unto that Light." literally describes many of the end runs in the Orbs - what I called the "light wash corridor" in the earlier post in the Color Radiation section. I recommend Orb Runners read the entire short text of Liber Librae. We identify two essential keys for effective magick running the Orbs. Jacking in and endurance. Jacking in means immersing as much as possible all of one's sensory and extra sensory attentions into the Orb environment. You are not looking at graphics on a screen, rather you are in another world teeming with life just as much as the one you came from. Feel the weather of the orb, the humidity or dryness of the air on the skin. Get a sense of the texture of the walls. Feel the cool stones on the feet in some orbs or the soft grass in others; the fog rising from the cobblestones when starting the Courage or Hero orbs Scale down visual perceptions to the size of the avatar so that when you encounter huge Buddha or Star Goddess (Nuit) statues, etc. you get a sense of the awesomeness of their size; that same sense of an unexpected vista and grandiose feeling you might get the first time being inside the skyscraper canyons of New York City, seeing the Grand Canyon or a Redwood tree, possibly Niagara Falls; maybe boarding a gigantic ocean liner? It's the sense of suddenly encountering something infinitely larger. Just as ritual magick stimulates all the senses to align with the invocation or evocation, we use our imagination in all our senses to immerse our collected presence into the gaming orb. Smell the sweet pea and vanilla fragrance of Wisteria or tangy lemony smell of Daphnes, or however you picture the flora and fauna in the Peace Orb or any of the other orbs with lush, verdant landscapes. The music and sounds in these monads contribute a great deal to the magick. E.J. Gold's flute playing turns up in several orbs especially the cleansing ones. I wrote elsewhere of West African flautists who played their flutes over our bodies to psychically cleanse our energy fields. This kind of psychic cleansing gets highly recommended on a daily basis to any sensitive who regularly comes into contact with humans. In the Remedy and Power orbs the player gets a selection of different avatars to choose from between various male, female or animal characters. Trying on different bodies to run the orbs results in different perceptions and sensations. It appears a practical way to get the sense of the shamanic practice called shapeshifting. Ever wonder what it would feel like to travel as a fish? The second key is endurance. It seems that the longer a player is able to stay in the Prosperity Path Orbs, the stronger the effect becomes, the greater the magick. This doesn't mean grimly holding on fighting back tears of boredom just to stay in one world. Some of the orbs have things to do that encourage a longer stay. The key to endurance is repetition; run the orbs on a frequent basis. Repetition in the Deluezian sense where whatever repeats is different. In other words, run the orbs frequently, but always slightly different. One can stay interested, and thus attentive, after several thousand runs of any particular orb by noticing what is different about it, or running it in a different way; paying attention to and affirming difference. For instance, notice the size difference of the Cube in the Anger, Guilt and Energy orbs as compared to others orbs like Stress Relief, Peace or Karma Wash. Different orb runs can get stacked, played one after the other, to form a series. I've had success combining the Courage and Hero orbs when preparing for excursions out of the country or even travel outside my zip code. There exists a class of orbs that require only 1 - 3 minutes to run. These all end with the colored light wash corridor leading into the Clear Light. Before this corridor is an area I refer to as the middle antechamber as it denotes a space dividing the outer courtyard from the light wash end run. Often, you'll see three Buddhas on either side, six in total to suggest Tiphareth. The two sides appear symmetrical, but often it's possible to discern a subtle difference. For instance, in Amy's Beauty Boost, the middle antechamber has two "lightfalls" - like waterfalls, but with light - on either side. If you bring yourself (in the avatar) close to the lightfalls on the left side, she is able to sit at the edge whereas she has to stand when close on the right side. If the middle antechamber = Tiphareth then the left side would be the Pillar of Mercy and the right side, the Pillar of Severity. It's more severe to have to stand, merciful to sit. Subtleties such as this, qabalistic or otherwise, abound through the orbs. Another way to notice differences in orb run repetitions is to pay attention to the juxtaposition of spoken word statements ("You are now carrying a copy of the American Book of the Dead" etc.) with the musical and environmental soundtrack. Sometimes you'll pick up something with its statement at the same time a flourish on the flute occurs as if accenting or affirming that event. Through observation, the various series of sounds can form a disjunctive synthesis between each other determined, in part, by the chance operation of the run trajectory. The whole soundfield then becomes perceived as a musical event. Metaprogramming - one of my favorite runs. The Metaprogramming orb has seven modules, in common with the Law of Octaves, with the octave note appearing as the Clear Light at the finish. Each module has qabalistic references - module 2 feels very much like Chokmah, module 3 like Binah, etc. There are subtle lessons in qabalah in each of them. Try running through module 6 with diffused vision and see what happens. Some quite interesting visual effects can be created by going very close and into any of the crystals found in each module. It can encompass the whole screen and look like a completely different world. Or recall the passages in Neuromancer when Case is jacked into the matrix trying to navigate through the ice, the protective software of large cyberspace entities. Metaprogramming requires death. The Sufis say, die before you die. Ordinary programming, the so-called personality or ego, has to get temporarily suspended, in effect, die, before the new code can be imprinted. Ego death seems necessary to reach the depths where metaprogramming becomes effective. A gentler approach is to bring the depths closer to the surface where the attentive player can meet them halfway. If this has the side effect of making the transition through physical death easier, then you'll just have to live with that.